Continuing our series on screen portrayals of Pilate that I began in 2011 during Holy Week. The posts on portrayals of Pilate by Rod Steiger, Richard Boone, Barry Dennen, Hristov Shopov, Telly Savalas, Frank Thring, Stephen Russell, Greg Hicks, Cyril Richard, Stephen Moyer, Dennis King, Keith Mitchell, Leif Erickson, Peter Firth, David Bowie, Lowell Gilmore, Hurd Hatfield, Vincent Regan, Arthur Kennedy, Gary Oldman, Ian Holm and Pilou Asbaek may be viewed here, here, here, here here , here, here, here, here , here , here, here, here , here , here , here , here , here, here , here , here and here. Pontius Pilate? Of course he was true to life. You can’t call him a “heavy”! He did his best to prevent the Crucifixion. He was merely overwhelmed by odds. You and I could not have stood up before such opposition. Incidentally, I think that that character was one of the best, if not the best that I have ever portrayed upon the screen. 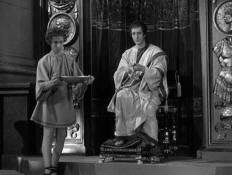 Rathbone portrays Pilate as a schemer, always on the look out to make money, a master manipulator. Yet this master manipulator is overwhelmed with grief and regret after he condemns Jesus. His lament of “What have I done! What have I done!”, gives evidence that he sensed the importance of what had just happened. Go here to view the film. The scenes involving Pilate and Christ begin at 48:16.